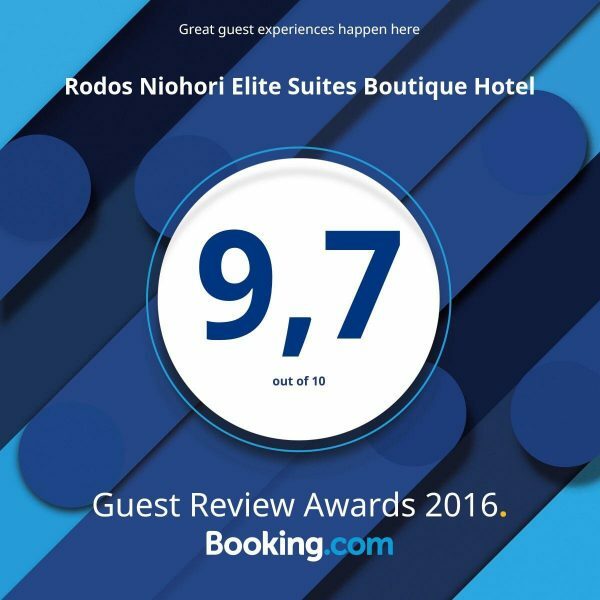 Rodos Niohori Elite Suites boutique hotel in Rhodes, consists of three independent and stylish suites named after three local and impressive flowers Hibiscus, Bougainvillea and Jasmine Suites. 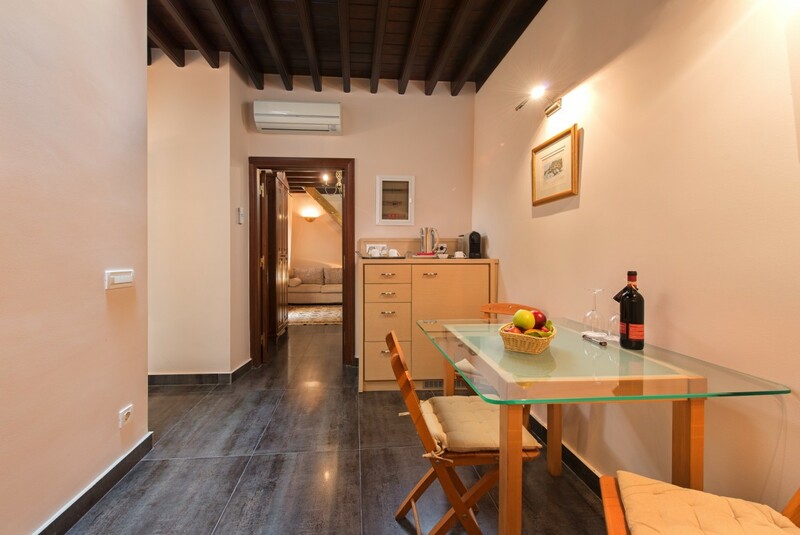 The three luxury suites are designed differently fulfilling your particular needs. 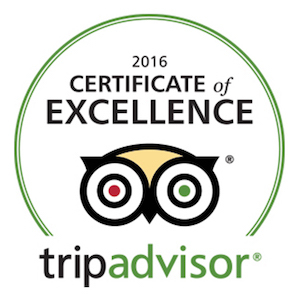 It is the ideal place for honeymoon, couples or family vacation. This Junior suite of 45 m.sq represents the good old times. 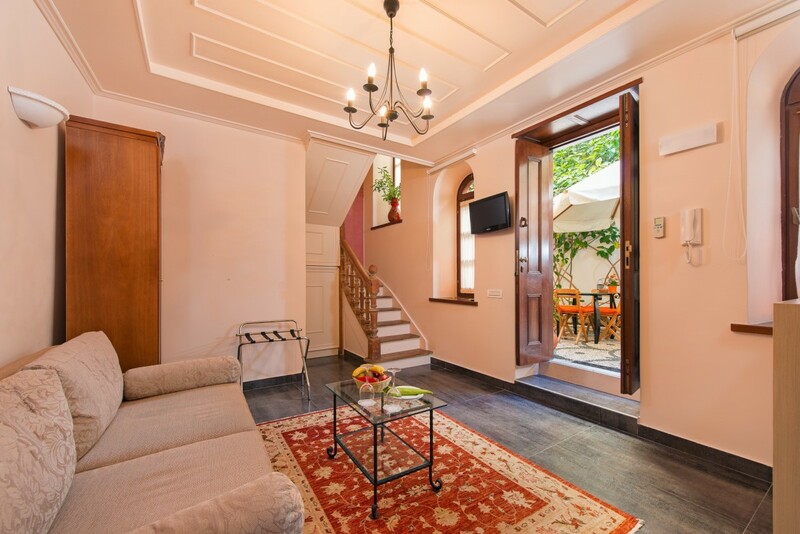 Coming inside the main entrance of this apartment from the garden ,one is first confronted with the sitting space with a sleeping couch, best suited for the smaller ones and the reason why we kindly call a Junior Suite’ and accomodate up to 3 guests. Here is the place where the staff of the aristocrat family used to boiled water in order to wash the clothes of the family and the old wooden stove (plistario) still remains is it used to be. Going through a door one enters the separate dining room with a dining table, fridge and Nespresso machine. 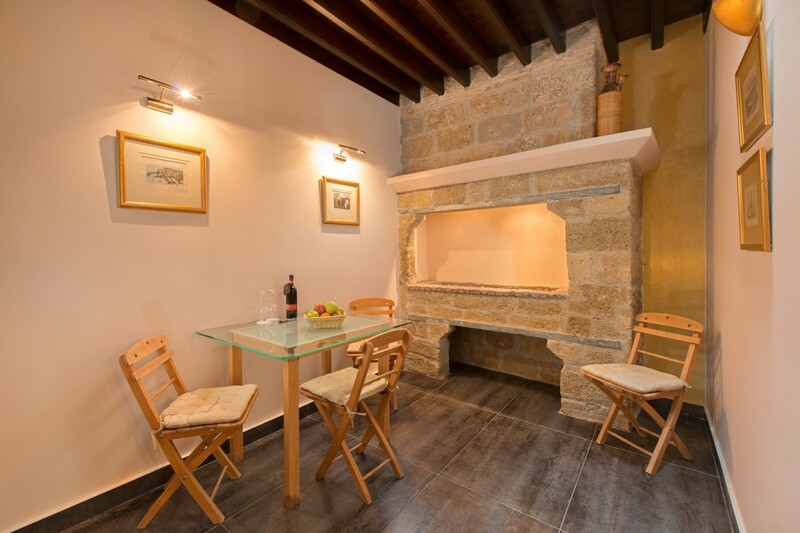 In this dining room is a fire place where the food used to be cooked and the owner left the fire place and its chimney intact, which gives the room a special character. On the ground floor there is another door in the dining room that leads to a small hall with the bathroom with shower. 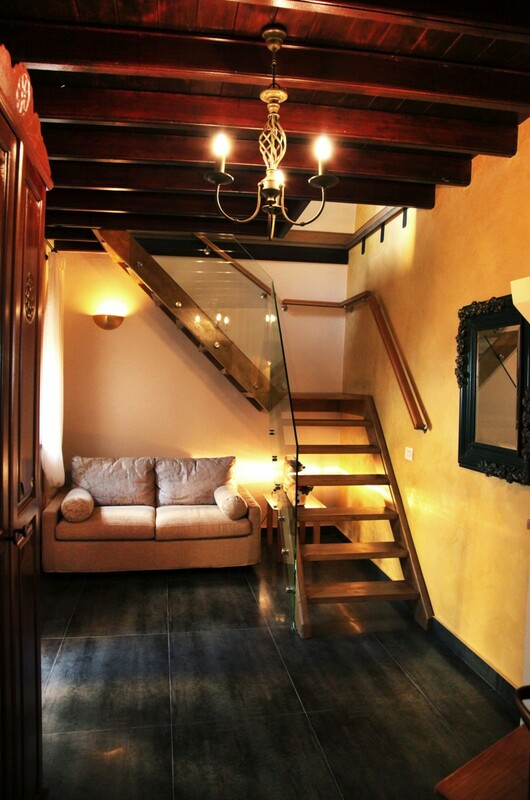 Going upstairs is the main bedroom, that leads to its private terrace 12 m.sq. In this suite, the second floor is built as a steady open plan high raised platform reachable through an open stairs in the living room. 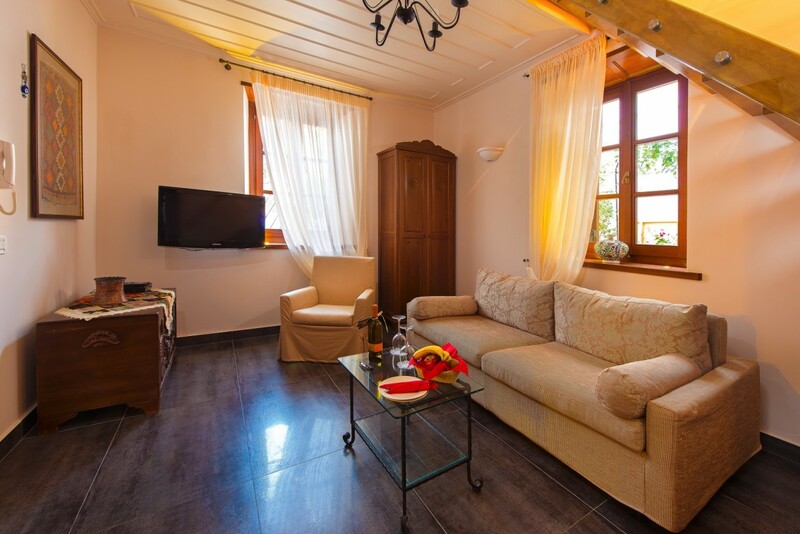 Welcome in our Hibiscus Suite! 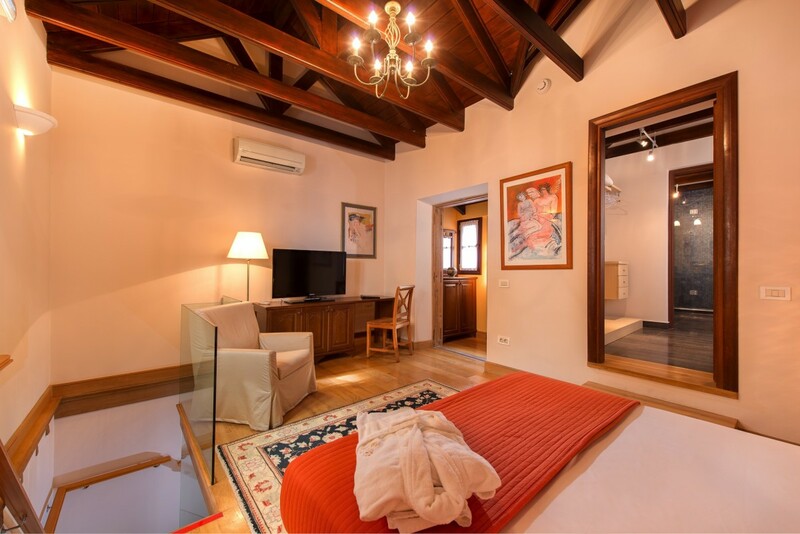 This romantic Superior suite of 50 m.sq is in the possession of the beautiful old wooden stairs and a wooden ceiling which characterize this room and makes you feel going back in time. 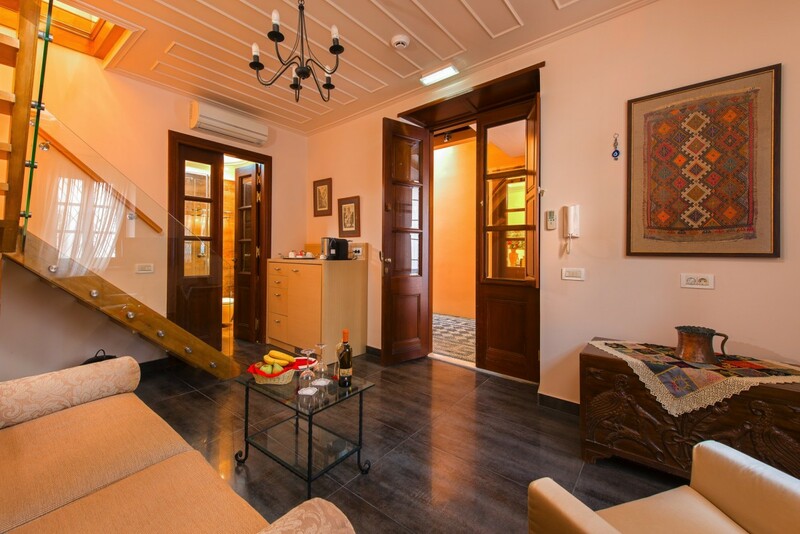 The nice terra cotta colors in the apartment give the whole look an eastern twist, that is imbedded throughout the Greek Culture and makes it such a special mixture. The great antique mirror and box and lots of other Greek small gadgets like antique vases and paintings will make you aware constantly that you are the one that is lucky enough to stay in such a great place. And as there are only 3 suites, you are truly amongst “the happy few”. You will find the main entrance of the suite in the courtyard, where breakfast is served. On the ground floor there is the living room with a double sleeping couch and a bathroom with shower. 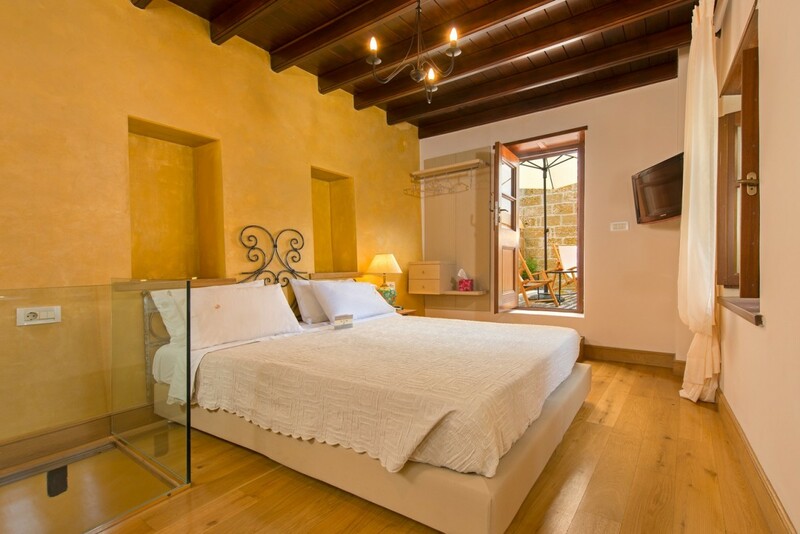 On the first floor you will find the bedroom with a queen size bed and also a bathroom with shower. 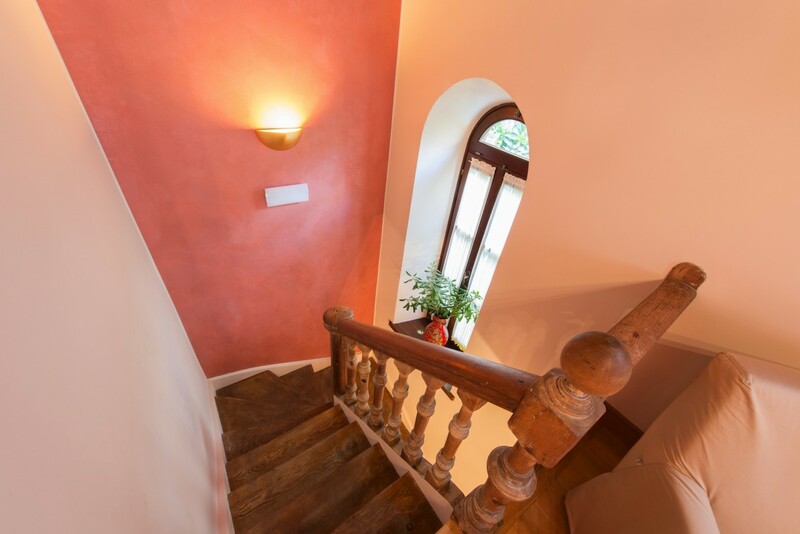 This floor is built as a steady open plan high raised platform reachable through an open stairs in the living room. 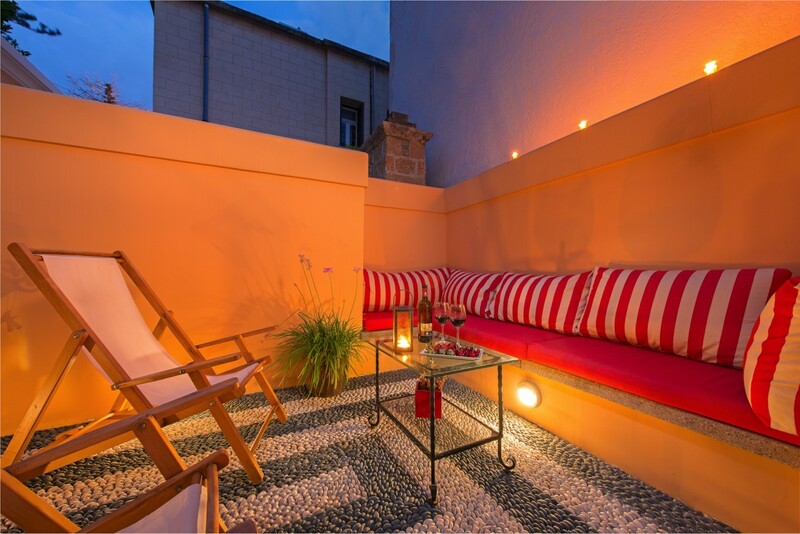 Of course for your comfort you will find your own private 13 m.sq terrace for sunbathing and nice evenings outside. 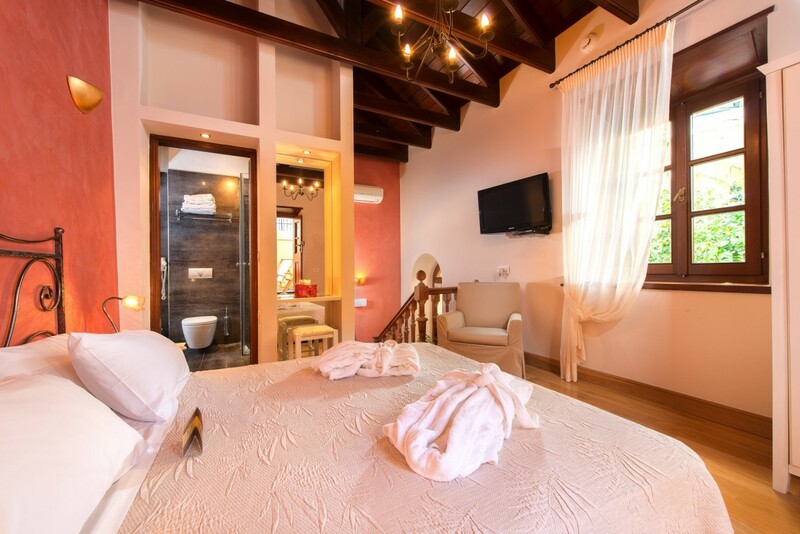 Enjoy your stay in the Bouganvillea Suite! 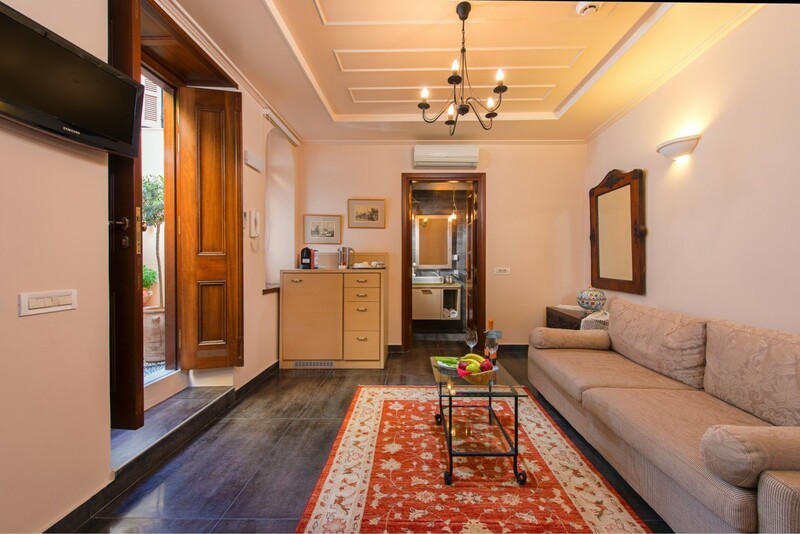 This Exclusive suite of 55 m.sq is the most spacious one and it is the only room reachable from separate entrance. It can accommodate up to 4 guests. Coming inside you will feel the cooling effect of its large granite tiles. The apartment consists of 2 levels. On the ground floor there is the living room and a bathroom with shower. On the first floor you will find the master bedroom, the walk in dressing room, a spacious bathroom and a private terrace of 14 m.sq. The first floor is built as a steady open plan high raised platform reachable through an open stairs in the living room. The bathroom in the master bedroom is reached through a large walk in dressing room. You will be surprised to find 2 showers next to each other in the big showering space, seems to be reason enough for a playful bathing ritual at any time of the day, ideal for honeymooners. 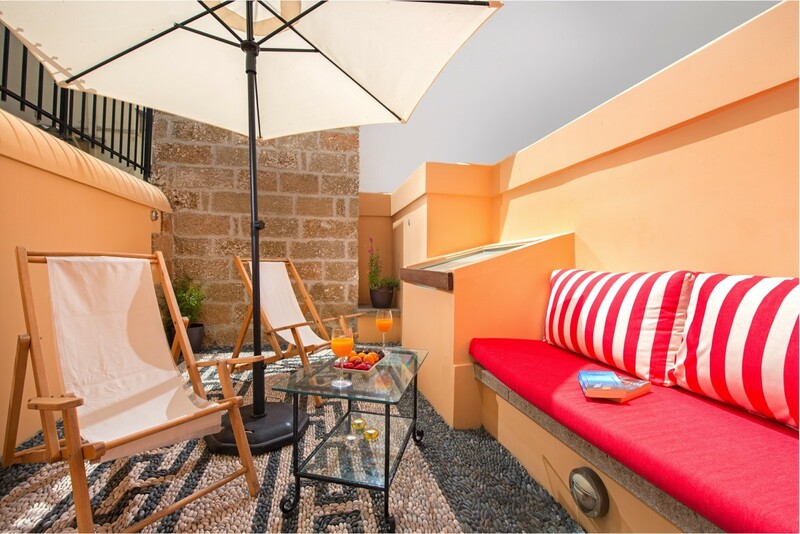 The Jasmin Suite boosts a spacious terrace with 4 sun loungers and an umbrella for the sunny days. 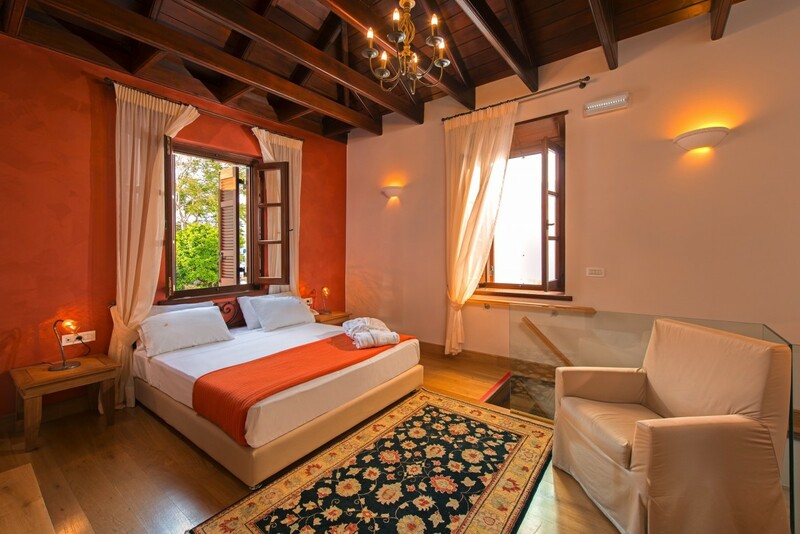 Jasmin suite is the absolute place for a comfortable and luxurious stay!